"I'm looking for my mother. She said if I get lost I should stand next to the pretty bee." Virtually forgotten amid the success of the very similar Will & Grace, Ned and Stacey aired on the Fox network from 1995-1997. This short-lived sitcom had two major things going for it: stars Debra Messing and Thomas Haden Church. Church was just coming off of his well-known role as Lowell Mather on the hit series Wings, while Messing was a fresh face with a unique look that people seemingly would be enchanted by instantly. Until the beginning of his career renaissance in 2004's Sideways, Ned and Stacey was the last time we had heard from Thomas Haden Church. He made audiences fall in love with goofy mechanic Lowell on the aforementioned sitcom, and he was looking to ride his charm to a successful new series that he actually starred in. He does a solid job as Ned , who is much smarter than Lowell; an ego-maniac that lives in a posh apartment. Comparing the two roles really shows off Haden Church's range, including many skills that would come to the forefront in Sideways, and played a part in landing him a prime (yet secret) role in the forthcoming Spider-Man 3. Debra Messing's character in Ned and Stacey can now be seen as a precursor to her work as Grace Adler on Will & Grace. Her Stacey is in a similar social class as Grace, this time working as a reporter for the Village Voice. Stacey isn't written as bitingly funny as Grace is, lacking the inhibitions of completely speaking her mind that Will's favorite gal shows off on an almost daily basis. The supporting work is solid, with the gorgeous Nadia Dajani and funny Greg Germann playing a couple that become friends with the title characters. The show has been compared quite a bit in recent years to Messing's career-maker, and rightfully so. Messing's Stacey, and Hayden Church's Ned also share an apartment, only this is the result of the ultimate marriage of convenience. The pilot sets the table for this premise, but, as a premiere installment, it's very disappointing. Haden Church appears to be yelling during much of the show, and aside from being in a seemingly quiet bar, there doesn't seem to be any real reason for it. After a rocky start, the laughs and chemistry start coming together in the second show, Portrait of a Marriage. This episode has some very funny moments as Ned discovers that his fake marriage to Stacey is a better union that many of the legitimate ones that he knows personally. Some of the other highlights on the first disc are Cover Story, where one of Stacey's stories could pose a problem for Ned's job; Here's to You, Mrs. Binder, where Ned falls in love with Stacey's mom's best friend; and Halloween Story,, which brings Ned and Stacey closer thanks to some antics at a Halloween party. Disc 2 gives Stacey a Reality Check when she has to take a job as a waitress after she realizes just how far in dept she is. A couple more holiday-themed episodes come to us in the form of the Thanksgiving Day Massacre where a dinner goes very wrong, and New Year's Eve, when Stacey foregoes a party that Ned is throwing so she can go on a date. The episodes on Disc 3 feature some real gems as well, including Friends and Lovers, which finds Ned becoming sexually involved with another of Stacey's acquaintances, this time an old high school rival. The very funny The Gay Caballeros finds one of Ned's big clients mistaking him for being gay. This first season ends on a great note with The End, Part 1, , which finds their "marriage" threatened when Stacey's latest romance becomes very serious. Ned & Stacey didn't evolve much during its three-season run, which might have been one of the major factors in its demise. While sitcoms don't have to change much (and often shouldn't) to last, shaking things up, even slightly, keeps things fresh and keeps audiences tuning in week after week. If Ned and Stacey wasn't the huge success that all involved hoped it would be, at least it launched the career of Debra Messing, and was an important step in Thomas Haden Church's as well. Image Transfer Review: Each episode is presented in its original full-frame format, but the overall sharpness of the images leaves much to be desired. The images are only lightly detailed, with everything having a very soft look to it. The colors are nice, but somewhat drab, yet there isn't any bleeding or other blemishes. There is only a little bit of grain and dirt, and nothing that is overly distracting. Audio Transfer Review: The shows are in Dolby Digital 2.0, making decent use of the surrounds, mainly for the slightly annoying laugh track. The dialogue and music always stay up front, and the former is always clear enough to hear over everything else. Extras Review: There are a pair of extras (aside from a collection of previews), both of which are on the first disc. There's an audio commentary track for the pilot episode, during which series creator Michael Weithorn talks about how the show came about, struggles with the network, and how great his cast was. 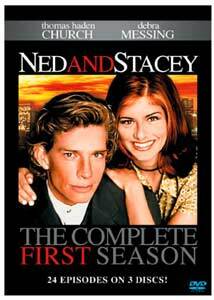 There's also a 22-minute featurette called Strings Attached: Ned and Stacey, Season One. This piece has new interviews with both Debra Messing and Thomas Haden Church, as well as in-depth talks with the rest of the cast and a few crew members. Ned and Stacey will never be considered as a great sitcom, but it will always be remembered because its title characters were played by Debra Messing and Thomas Haden Church. Sony Pictures Home Entertainment brings the show to DVD for the first time with Ned and Stacey: The Complete First Season. All 24 episodes from the inaugural season are here, with decent audio and video and a couple of nice extra features to boot.